Making of Dji. 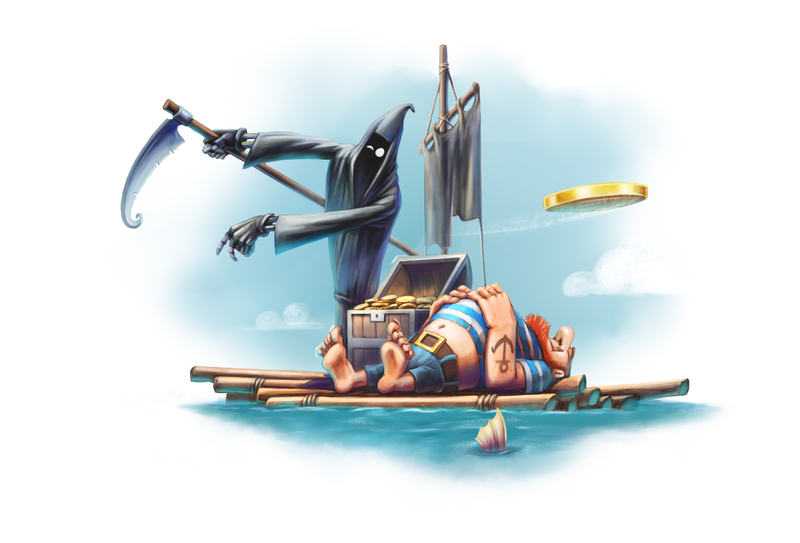 Death Sails : Simpals Animation Studio located in Moldova produced its fifth short animated film “Dji. Death Sails” Directed by Dmitri Voloshin. At first, we had to find the right setting that would make it clear that death should appear right there and then. So, we chose the ocean after a shipwreck as the setting. As our Dji can’t swim yet, he walks on water. We drew inspiration from movies, videos, books on the history of pirates. The preparation was very extensive. So, we have an ocean, a small raft floating amid the wreckage, a pirate dying of thirst (there must have been at least one survivor) and a chest of gold, which is completely useless in the present circumstances. Here we go! And here we come. The first problem. Where should we set the camera? Give us at least one landmark! The only guiding marks that we could use were the sun and objects floating in the water. But while working on the storyboard, we faced another problem – how to create the correct movement of the camera in the shot with Dji running on the water so as not to disorientate the viewers? We changed the shot thousands of times, but finally we chose the variant that worked best for us. By the way, the model of Dji hasn’t undergone any changes. We told you about it lasttime. So, the model of Dji was ready. As for the pirate, we had to create a new character from scratch. None of us had ever met a real pirate and at the same time we didn’t want him to look like any well-known pirate (like Jack Sparrow). We tried to find a reference in books. But pirates portrayed in books wear hats, frock coats and sometimes wigs. We didn’t want our pirate to look like that. So, we started searching. As for the body, the variant that was approved by the whole team was found quite quickly. 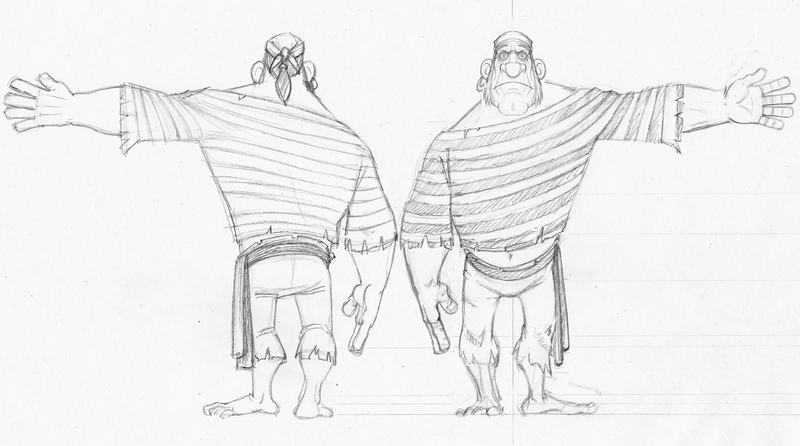 Our pirate is a thick man who has strong arms and for some reason not very strong legs. But we like this testosterone donor. We even drew a tattoo for him. After we finished the body, we started drawing his face, but it turned out to be quite problematic to choose the right variant. 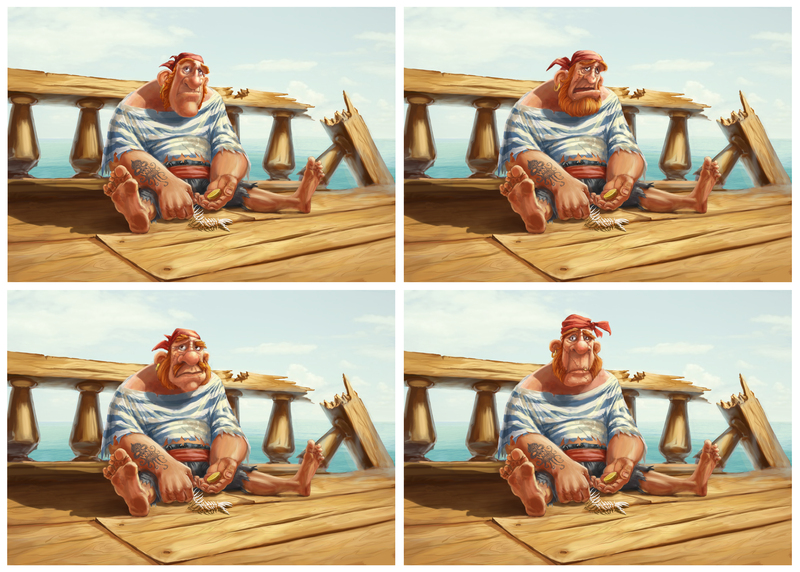 So, what kind of face should a pirate have? Well, if he is a pirate who survived a shipwreck, he must be harsh, tough and fearless. In other words, nothing can scare or harm him. We had about 10-12 variants of the pirate’s face. But none of them were good enough. He either looked vicious or too feeble. Eventually, we made him look like a red-haired skipper. Now he is really cute! 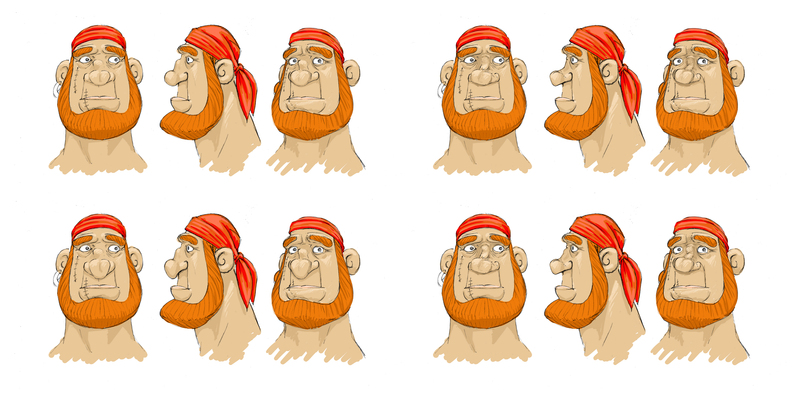 After we approved the face, we had to work on his beard and the hump on his nose. And again, we had lots of variants. So, meet our Sam. Like all pirates (we love stereotypes), he likes to drink and he is extremely greedy. He survived a shipwreck, but instead of taking water bottles, he saved a chest of gold. Well, Sam is not very smart, but he never lacks strength. In the end Sam will show his wits and cunning, but we’ll talk about it later. The big fish is one of the main characters of the film. We decided that it would be a bottom-dwelling fish. Its real prototype in the underwater world is the mudskipper. But it is too small for our venture. 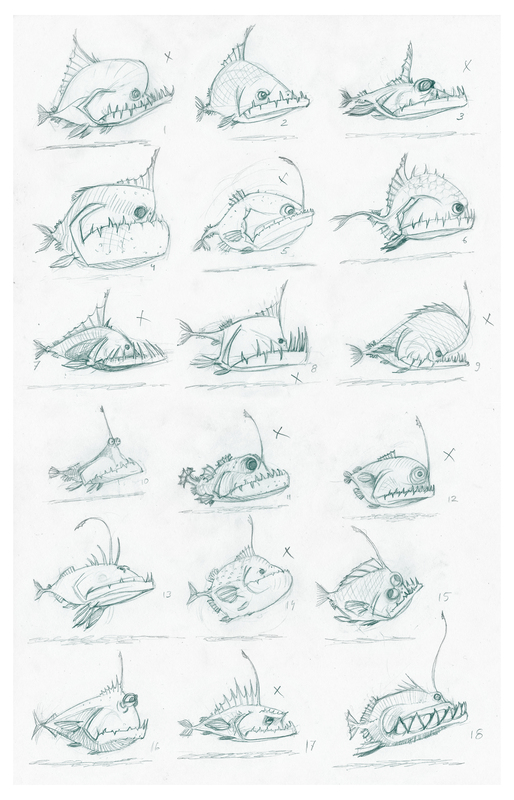 In order to understand what a bottom-dwelling fish should look like, you need to think like a bottom-dwelling fish:) Just like in typical detective stories. So, we drew 25 variants and finally managed to choose the one we liked. After that, we inflated it and made something between a whale and a stonefish. Our fish is named Fish (a popular name in fish community). It’s a lazy silent plotter, waiting for the right moment to catch its prey. It lures the victim with its fin, pretending to be a small fish. We had to choose between these two variants. We had one more character, which, unfortunately, wasn’t included in the animated film. It’s a small fish. We’ll tell you later why it wasn’t included, but now a few words about the fish itself. 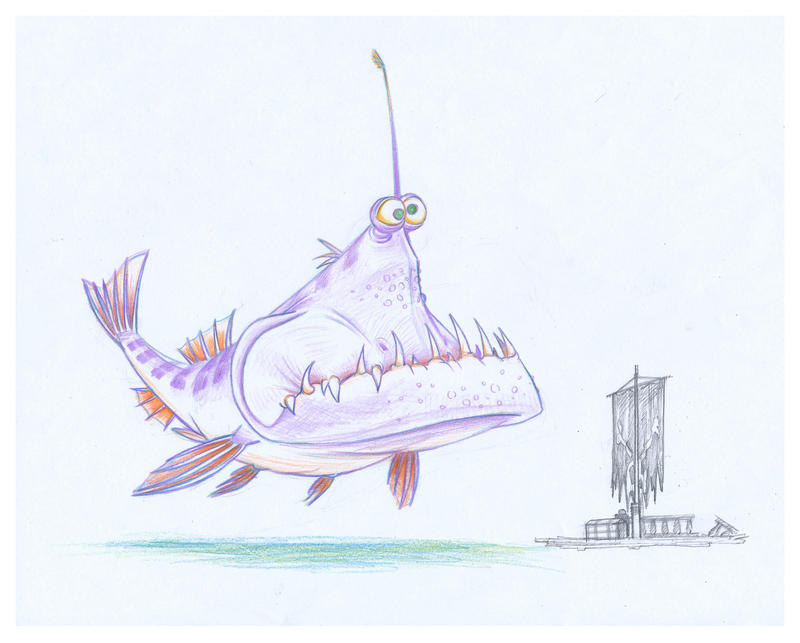 Its prototype is the telescope fish with big eyes. So, we created a small fish that was quite cute, funny and silly. It wasn’t totally perfect as its left hemisphere didn’t coordinate with the right one, so the fish could rotate its eyes in different directions like a chameleon. We didn’t include it in the film, because we had some problems with compositing that we couldn’t solve, so we just changed the script a bit and voila! Since the appearance of the first color film, the color palette plays an important role in film production, which is quite understandable as it can give your film a unique look and feel. As it always happens, artists deliver 3 billion variants, but only 1 or two of them are used in the film. 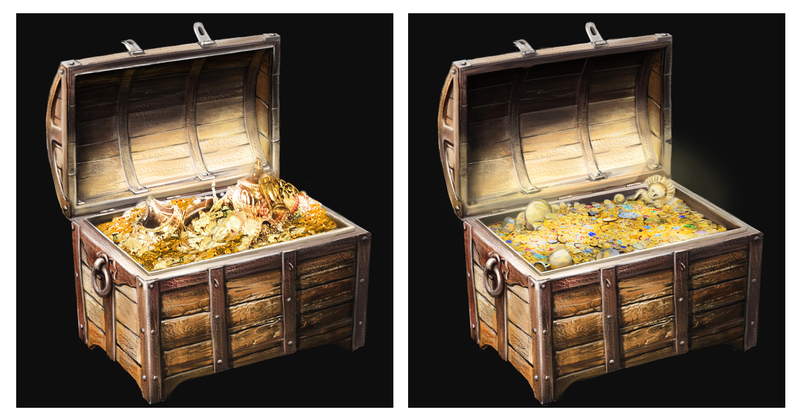 We had to spend some more time on the chest as we didn’t know what treasure we should put inside. Some of our guys insisted that it should be gold and diamonds, others claimed that the greatest treasure is having a good job and family. But we didn’t know how to put a job and family into the chest, so we chose gold and diamonds. 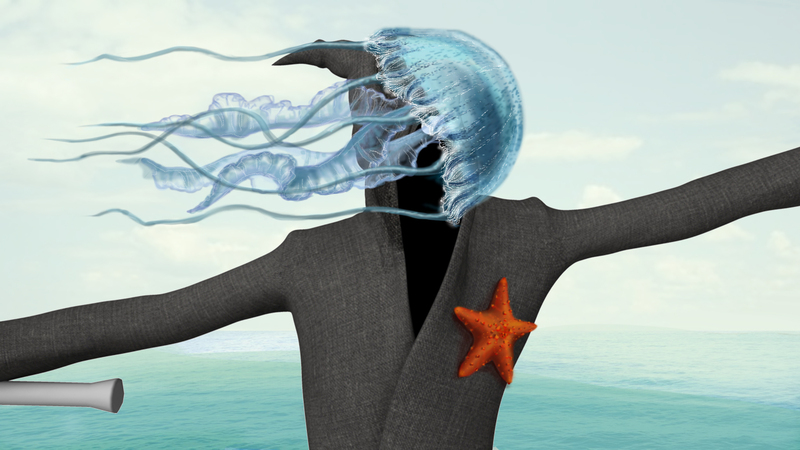 As the saying goes, if sea stars and jellyfish stick to a cloak, there should be a reason for that. In our case, these secondary characters appeared not from the very beginning, but in the process of film production. We tried to include them in the story, it worked out well, so we decided to keep them- a simple scheme which greatly complicates the whole process, but gives positive emotions in the end. According to our data, any self-respecting raft must include logs, a mast and a sail. As it’s a pirate’s raft, it should also have a corresponding flag. We don’t know how much time it took the pirate to build this raft. But! It took us a pretty long time to draw it. Our engineers verified every inch of this construction. We made cross-sectional drawings as well as views in three quarter perspective. Eventually, we liked the way it looked and were sure that it could withstand the weight of two passengers. So, we placed our pirate on the raft and started waiting for the guests that would come to visit him. The creation of clouds became a separate topic of discussion. In our animated film the sky covers 50% of the screen. So, we started searching for the right variant of clouds within and outside Moldova. In search of good references, our director went to the mountains. The clouds were redrawn numerous times, changing from cumulus into cirrus ones. In some versions the sky was overcast, but then it cleared up again. The weather was very unstable. After long hours of bickering, the right variant was found. The weather settled down and everyone’s mood improved. The big fish is a good character, that’s why it’s so big! 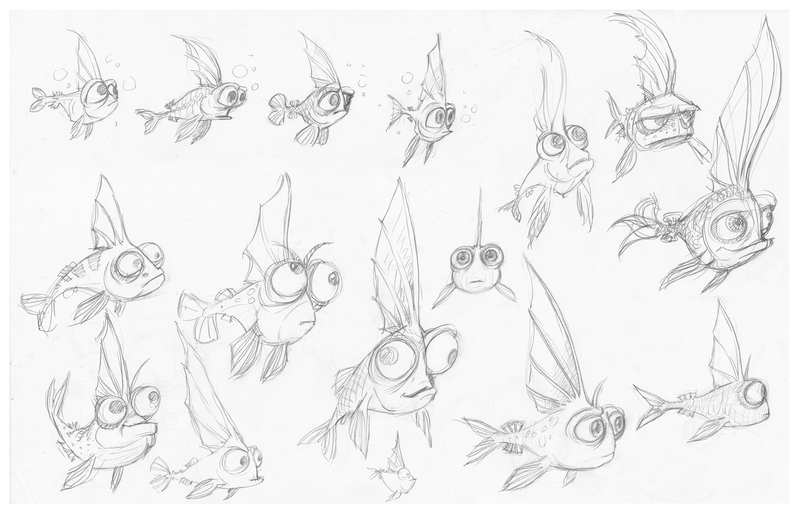 In order to make this character move, we created a separate setup for its fins, eyes, antennae, etc., after which the fish became more flexible and deformed quite naturally. 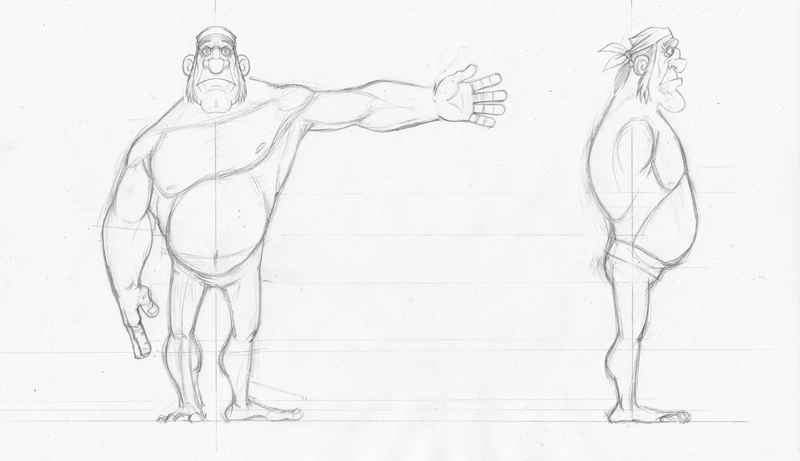 As our animated film is about water, the biggest challenge here was the interaction of the character with water. The thing that we haven’t done before. We watched lots of videos to understand how the character should move over the water. We tried to make a reference video, but none of the actors could stay up longer than 12 frames. 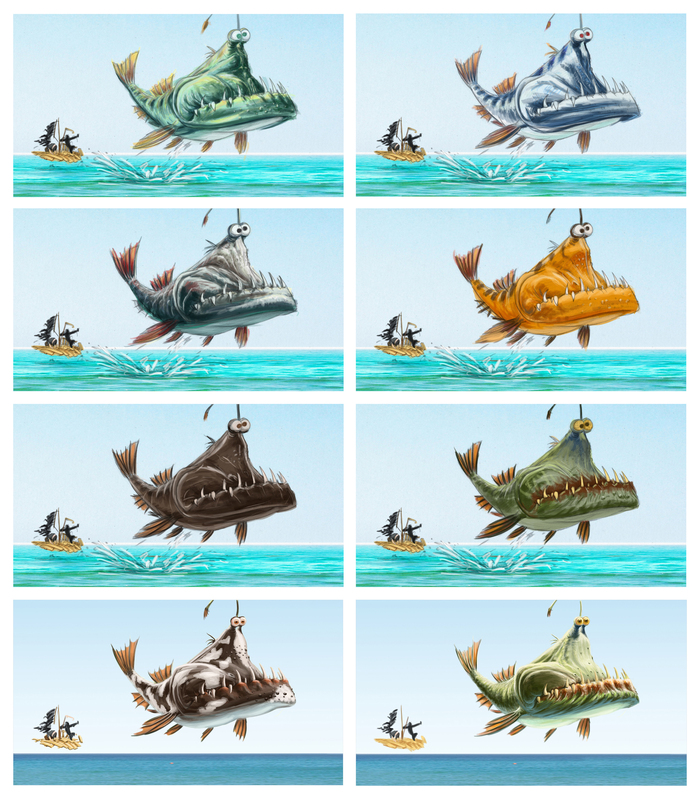 The most persistent ones drowned (just joking). The animators had to visualize how the character might move as at that point of time water simulation wasn’t finished yet. We made many versions of Dji running over the water trying to determine how fast he should move in order not to drown. 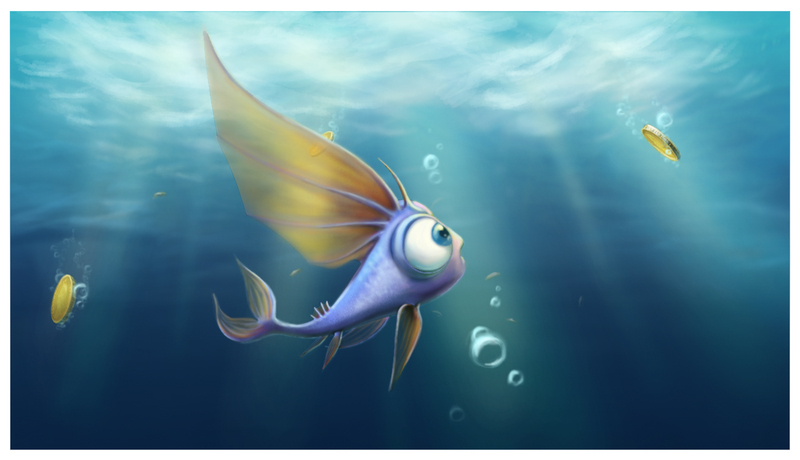 As for the fish, we calculated the speed of its movement, but we also had to take into account its big size. Initially, we had several variants of the ending. After some thinking, we decided that it was the right moment for the pirate to show his greedy nature. So, we started thinking what emotions (and actions) the character should express after landing at the bar counter. 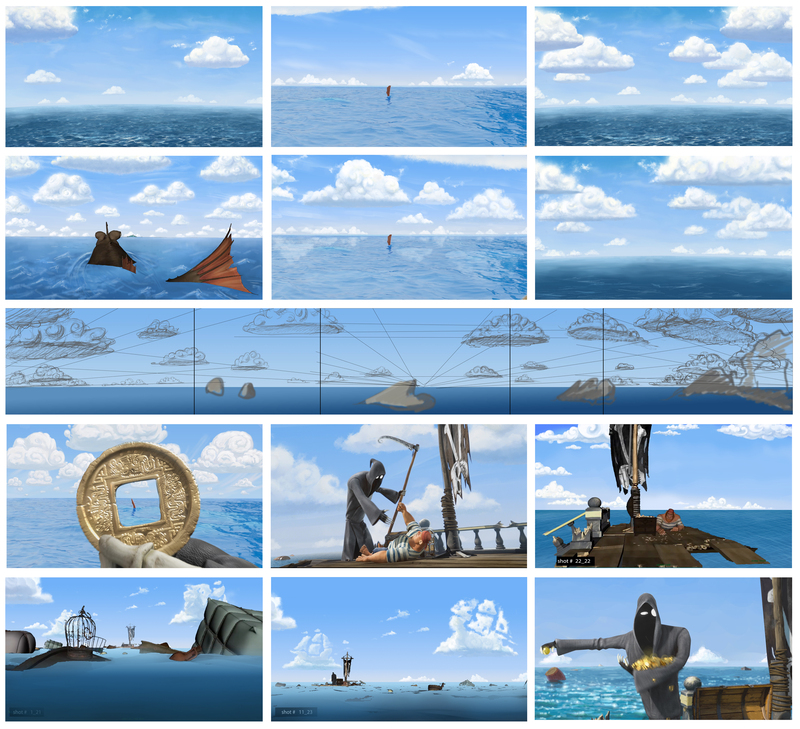 This time we had a lot of simulation work to do as we were making an animated film about water. But we’ll talk about it later. Now we’re going to tell you how we simulated Dji’s cloth, and namely his cloak. When the viewers look at Dji, they see Death. But our cloth simulation artists see only eyes and a cloak hanging on the bones. As Dji is a very active character, we had to do lots of cloth simulations. For this purpose, we used Maya’s nCloth dividing the simulation process into several stages: at first, we split the cloak into pieces, simulated each piece separately and then sewed all the pieces together. There’s one more thing. The question “what is Dji hiding under the cloak?” still remains open. 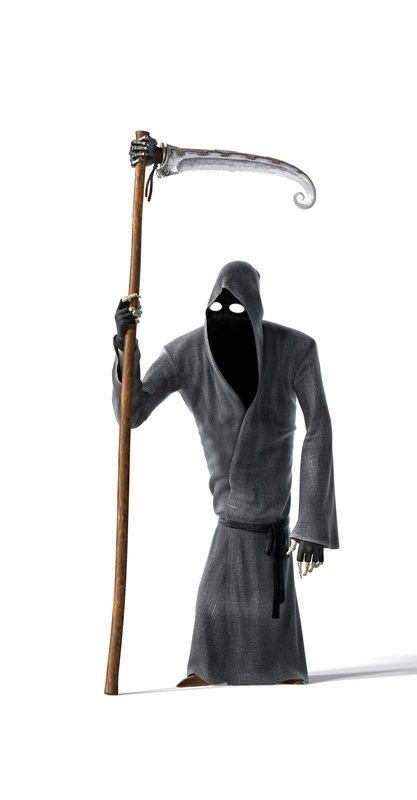 Of course, he has bones, but if you put the cloak right on the bones, it won’t look good. For these purposes, we had to create special geometry to make him look beefier. Well, this is not the end. There will be a continuation. In the third post we’ll tell you about the most interesting things, and namely: water simulation (we had to simulate a whole ocean! ), visualization and compositing. The lighting scheme was always pretty much the same, but we couldn’t use the same lighting in every shot. So, we had to adjust the lighting from scene to scene to create artistically beautiful images. The lighting in close-ups differs from the one used in wide shots. The most interesting part of this work was to adjust the lighting for Dji who is either surfing, or running over the water. We rendered everything on our farm. It took approximately a night to render one shot. Before the final approval each shot was rendered 2 or 3 times. The animated film was rendered with V-Ray. Everything was rendered separately: water, foam, pirate’s beard, objects and characters. We spent a lot of time on the visualization of water (refractions, reflections, the turquoise color), trying to achieve the same effect in 3D. When we did it, we realized that it would take ages to render those shots. Besides, it gave us very little fine tune control over each aspect of the image. So, the final look of water was achieved in compositing. As for the textures, we increased their resolution 4 times which reflected on the volume of visualization work. In order to cope with it, we created a simple pipeline and used the following hypershade node tree, which allowed us to render quickly and effectively. Of course, the most challenging shots for us were the ones that involved interaction of characters with water (the fish jumping out of the water, Dji rushing over the water surface). But since we came across some rather difficult things that only big studios can do and we were limited in our resources, we had to optimize the process and break it down into several parts. Each splash was simulated and rendered separately. To have more fine tune control in compositing, we rendered about 7 additional passes for water grading. So, if we had 6 splashes in one scene and each of them consisted of 7 passes, then we could use about 40 passes for water grading in one shot, which gave us greater flexibility. Each shot is the result of meticulous work with the image. The sky and clouds were added in compositing. The final look of objects and characters was also achieved in compositing. After seeing the tests, the director clutched his head in terror and softly explained to us that we misunderstood the task. It turned out that we had to simulate not just water, but a whole ocean with all the details: splashes, spray, foam, etc.. After such comments, we had to throw out all previous tests and start everything from scratch. 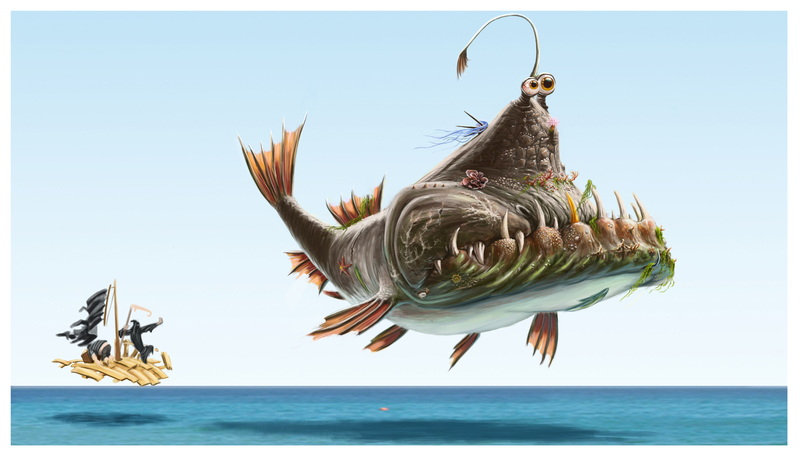 In our animated film water is the fourth character. Every splash (there may be several splashes in one shot) must look natural and correspond to the artistic vision of the director. In some shots we used several types of splashes. Water simulation became a great challenge for our studio as we’ve never done it before and the water itself is an interesting object, which also requires a lot of computing power. We had to figure out how to cope with the task, but not to the detriment of artistic conception. Thus, every shot was broken down into smaller tasks: splashes and the surrounding ocean. The splash in its turn was broken down into: basic simulation, foam and additional small splashes. In other words, one shot could include up to 10 separately rendered simulations. 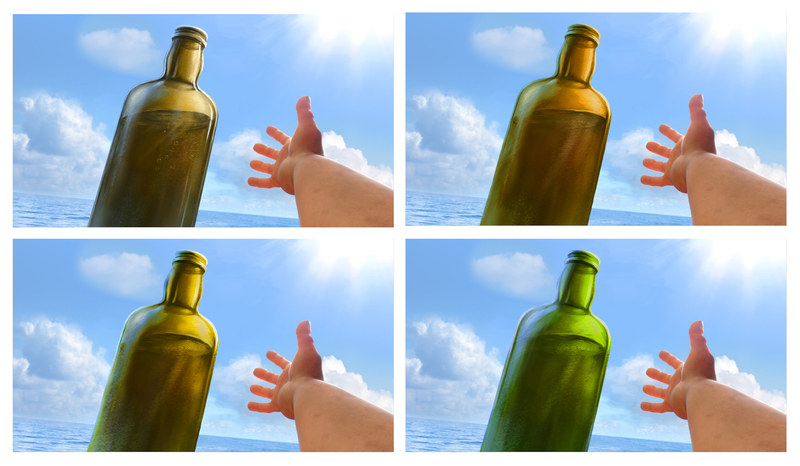 The final look of water was achieved in compositing. As a result of some simple manipulations, the water gets its specific color and refraction that create a sense of depth. 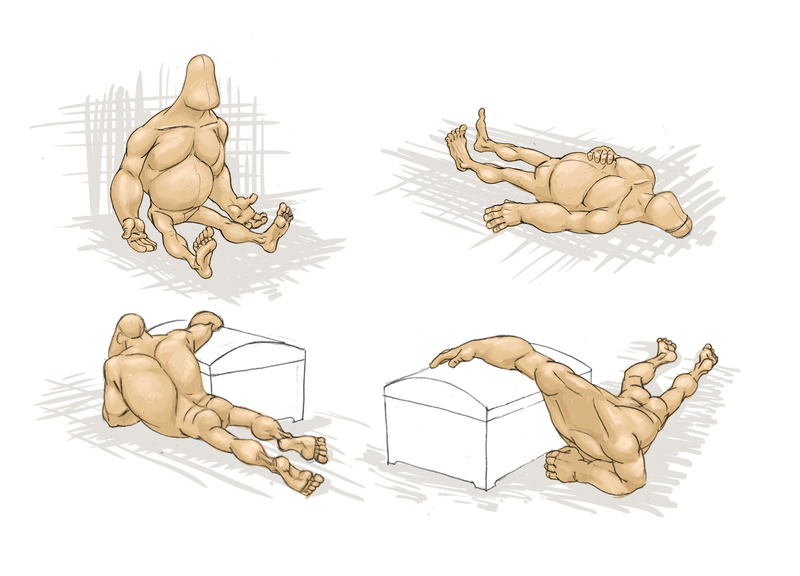 This is how 3D animated films are made. As you see, it’s a long and winding road. We enjoyed every step of the process and we hope that you’ll enjoy watching our film.